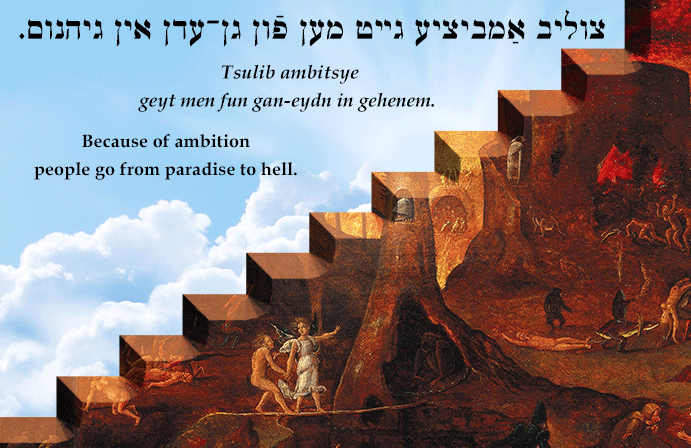 Yiddish Wit: Because of ambition people go from paradise to hell. צוליב אַמביציע גייט מען פֿון גן–עדן אין גיהנום. Tsulib ambitsye geyt men fun gan-eydn in gehenem. Because of ambition people go from paradise to hell. SOURCE: Stutchkoff, Der Oytser fun der Yidisher Shprakh. IMAGE: Detail from An Angel leading a soul into hell by a follower of Hieronymus Bosch (credit: Wellcome Library, London).